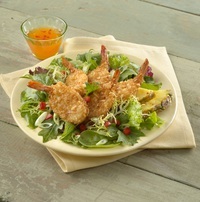 MRS. FRIDAY’S® LIGHTLY DUSTED SHRIMP 21/25 CT.
By: Mrs. Friday's From: King & Prince Seafood Corp. Select plump, juicy, tender shrimp are cut midway between round and butterfly, with a 35% coating of seasoned flour for a deliciously flavorful shrimp with a handmade, premise-made appearance. Great for operators currently hand-breading shrimp but want consistency and labor cost savings. MRS. FRIDAY’S® GOLD PACK® FANTAIL SHRIMP 21/25 CT.
MRS. FRIDAY’S® FLYING JIB IMITATION BREADED POUCH SHRIMP 38/65 CT.
MRS. FRIDAY’S® COCONUT BREADED BUTTERFLY SHRIMP 21/25 CT.
By Mrs. Friday's from King & Prince Seafood Corp.